MakerBot has launched Starter Labs, kits designed to help educational institutions get 3D printing systems set up quickly. Racking and build plate tape. 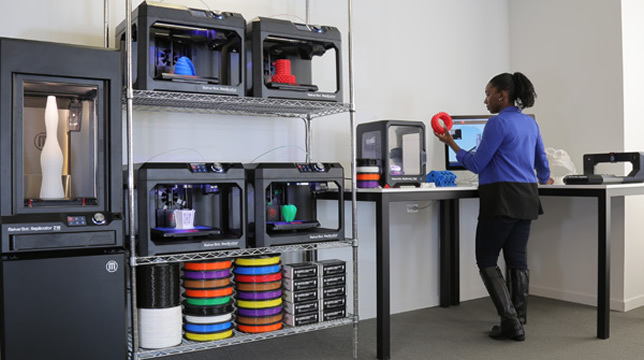 Schenectady, NY's Union College received a MakerBot Starter Lab as an alumni donation. Projects using it have so far "included modeling and printing geometric shapes to help visualize and better understand mathematical concepts, printing masks of historical figures to make historical facts more accessible and an ambitious effort to work with local artists in Vietnam to explore the intersection of high-fashion carved wooden shoes and 3D printing," according to a news release. "The MakerBot Starter Lab has already helped the college quickly make 3D printing accessible to more students to foster creativity and collaboration," said John Rieffel, assistant professor of computer science at Union College, in a prepared statement. More information is available at pages.makerbot.com.